Welcome to the COMPADRE Plant Matrix Database and COMADRE Animal Matrix Database site! 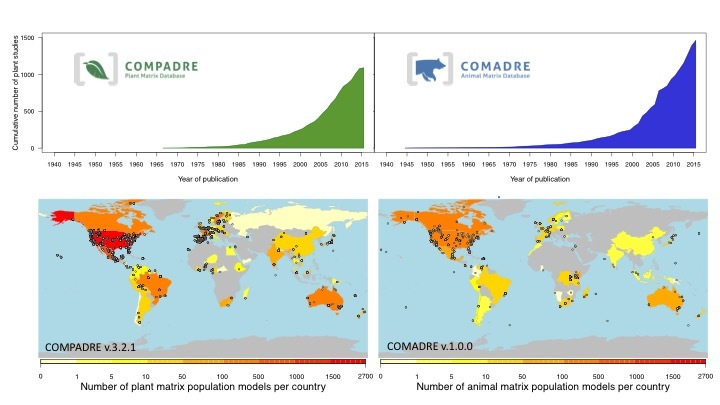 COMPADRE and COMADRE contain matrix population models of hundreds of plant and animal species. Both COMPADRE and COMADRE are open-access databases. Although login is not required, we suggest that users register to obtain notification of data updates, useful code, and important news. By using these databases, users are agreeing to the COMPADRE and COMADRE user agreement. The cumulative increase in number of plant and animal studies using population matrix models highlights the current and future potential of these databases to address global ecological and evolutionary questions. The worldmaps above show the number of population matrix models, and GPS coordinates of the study populations (when available) for the species made available in COMPADRE v. 3.2.1 and COMADRE v.1.0.0. More species will be released periodically, both for plants, and animals.